Für Informationen in Deutsch senden Sie uns bitte eine Email. 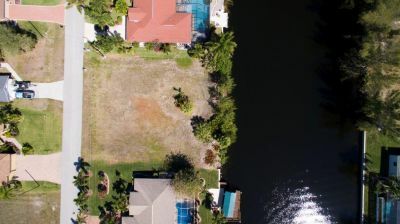 ***** OVERSÌZED three lot site in the South West of Cape Coral** Lot has 120 feet of waterline** Fabulous location close to Cape Harbor and all the great amenities like shops, watefront dining, entertainment, marina and more! ** About 15,000 sqft lot size in total** On an approx. 150' wide Gulf access canal** City water and sewer assessments are in and PAID. ** Great neighborhood for walking, kayaking, boating, etc. ; bicycle lane only 2 minutes away, connected to many bicycle routes, including to Surfside Area, Cape Harbour Marina, restaurants, bar, café and shops.